ASUS has successfully carved a niche for themselves in the gaming sector under the ROG banner, and provide a whole range of products catering specifically to gaming. 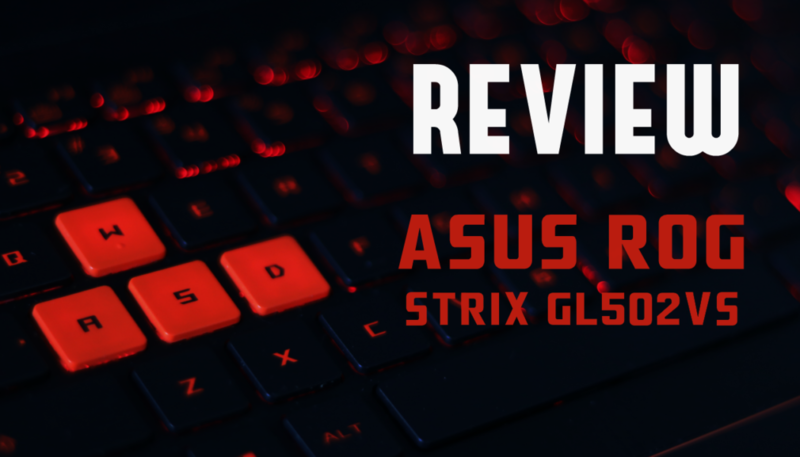 Today, we take a look at the ROG Strix GL502VS, their budget range laptop with a GTX 1070 GPU and G-Sync. ASUS hasn’t spared any expense when it comes to tech specs on this thing. The ROG Strix GL502VS is powered by a sixth-gen 2.6 GHz Intel i7 Skylake processor and 32 GB DDR4 RAM. 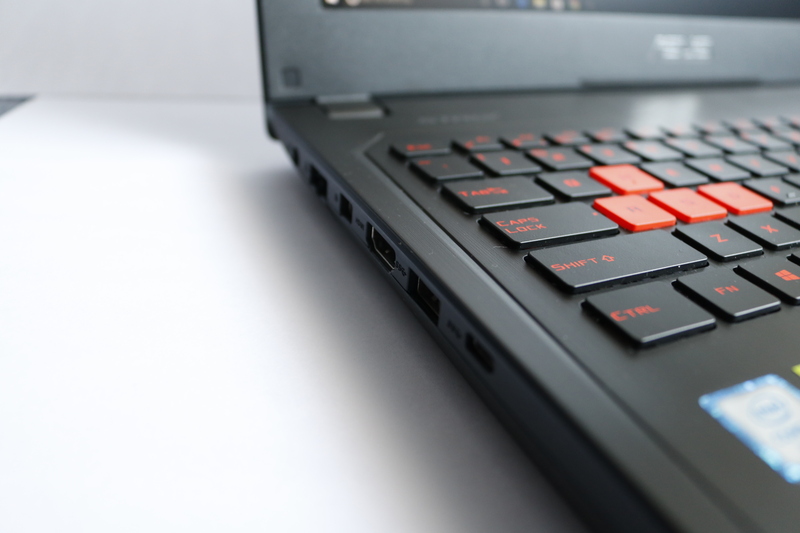 To take care of your gaming needs, the laptop employs a GTX 1070 GPU. The display offers two options: a 1920 x 1080 full HD panel and a 4K display, both of which come with G-Sync. Storage options include a 1 TB hard drive for media storage and an optional 128/256/512 GB SSD for booting up. Our review unit included the 1080p display and the 256 GB SSD. 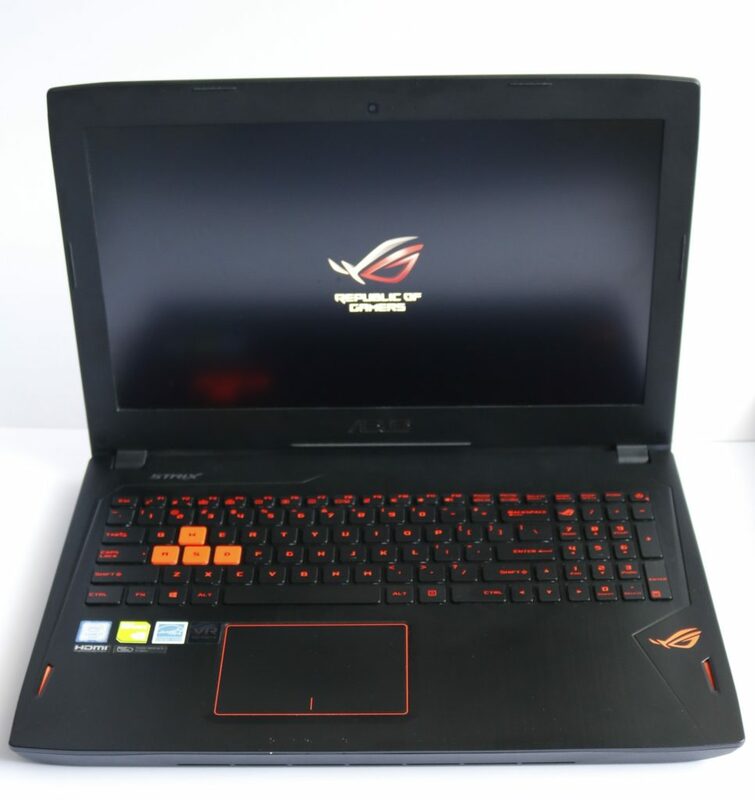 If you’re familiar with ROG laptops in general, you might reckon that ASUS is capable of making beautiful devices. Unfortunately, the GL502VS is not one of them. To cut down on costs, the laptop makes use of plastic for its entire body, apart from the lid that actually has a metal top. It has a brushed finish which makes it look rather good, but is disrupted by the bright orange backlit LED logo which honestly, makes you realize that the notebook’s aesthetics can’t be described as premium in any way. Opening up the laptop greets you with the same brushed finish on the keyboard deck, but this time it’s on plastic. 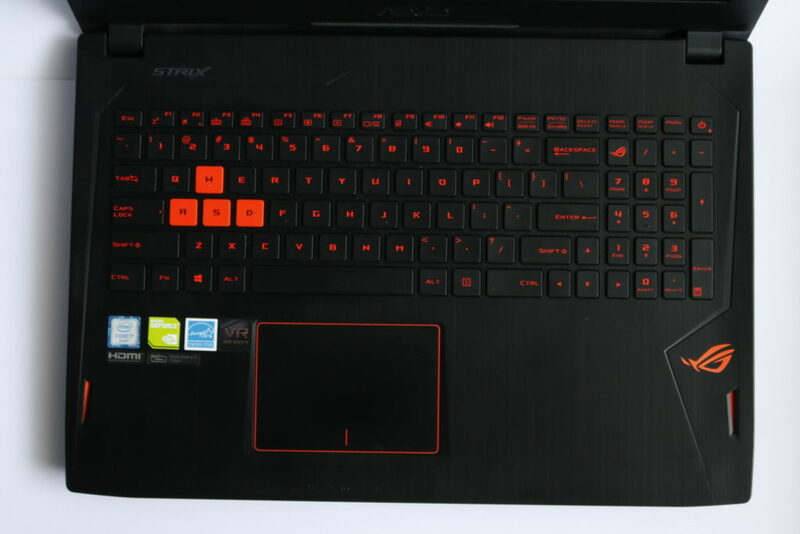 The keyboard has red backlight LED with black and orange keys, and the WASD keys are highlighted as they’re orange with black text. There’s an orange ROG logo right beneath the keyboard on the right side, followed by speakers which are also orange. The trackpad has an orange border as well, and so are the heat vents at the back and the rubber pads at the bottom. All in all, the laptop is a little too orange, at least for my liking. But don’t let that in the way, because once you get the laptop working, you won’t be paying attention to the orange highlights for long. The cost-cutting comes with its own benefits, making the laptop weigh somewhat less than other laptops in its class. The GL502VS weighs about 2.34 kg, meaning it is still more portable and can be easily moved to different places should you please. The laptop offers a plethora of ports for connectivity. On the left side, you have the charging port, an RJ45 LAN port, one HDMI port, one mini DisplayPort, one USB 3.0 port and one USB 3.1 Type-C port. Turn to the right, and you find two more USB 3.0 ports, one SD card slot and a 3.5 mm audio jack. To compare the laptop’s performance in Directx 11 and Directx 12, we ran in-game benchmark tests for three games: Rise of the Tomb Raider, Deus Ex: Mankind Divided and Ashes of the Singularity. We also tested Watch Dogs 2 to see how the well the laptop can run a highly detailed open world game, and the GL502VS passed with flying colours. Kindly note that Anti-aliasing and VSync were turned off during the benchmarking process. Rise of the Tomb Raider was probably the best running game on the notebook, with an average framerate of 98.9 FPS on Directx 11 and 108.5 FPS on Directx 12 on the Very High preset. Similarly, the performance for Deus Ex: Mankind Divided was impressive as well, with the game running on the Ultra preset. We obtained an average 54 FPS when running the game on Directx 11 and 56.9 FPS when running on Directx 12. Shifting to Ashes of the Singularity, we saw a slight drop in the performance, which was expected thanks to the sheer amount of detail and number of units present on the screen. The laptop performed well enough, with 44.5 average FPS on Directx 11 and 49.4 FPS on Directx 12 on the Crazy Preset. Finally, we ran Watch Dogs 2 on the Ultra preset settings, and 100% Extra detail. Here also, the laptop continued to impress us, with an average framerate of 50.6 FPS on Directx 11. The notebook has a Full IPS display panel with G-Sync, meaning that ASUS pretty much has most of the check boxes crossed for gamers. The colours are vibrant and crisp, and the screen’s brightness is pretty good for using the laptop in well-lit rooms. For the fans of the ultra HD, an option for a 4K model is available as well. The keyboard is pretty responsive, but nothing great. It is a full QWERTY keyboard with black keys and orange overlay (inverted for the WASD keys), and is lighted up by the red LED backlight. The power key seems to be a part of the keyboard as well, sitting on the top right on top of the NUM pad. I find it a bit silly, considering that people who are used to using the numpad might end up pressing the power button instead of the minus key. Add to that the fact that there isn’t any good reason for the power key to actually be there instead of someplace separate, and you can see where I’m going with this. I know, it’s not a big deal and you can easily disable the power key from shutting down your system, but it’s the little things. The trackpad is also average at best. It’s not exactly very smooth, and leaving fingerprints is relatively easy. Fortunately, you will require a decent mouse for gaming purposes, so I find it hard to see the trackpad getting a lot of use apart from general browsing. One issue that I did face with the GL502VS was the battery drain. For some weird reason, even with the charger attached, the battery would drop down to about 80% under long gaming sessions. I don’t know whether this issue persists with the model in general or it was just our review unit, but some research into this is advised. My guess is that the power from the adapter wasn’t enough to keep the beast of a GPU inside fully charged. However, I could be wrong. 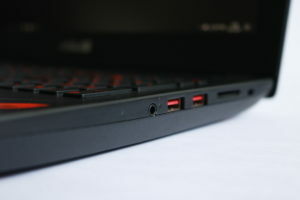 The laptop lasts a little over three hours of normal usage when not on charge, which is quite average for gaming laptops these days. As the case is with laptops, the ROG GL502VS comes with a bunch of pre-installed applications and utilities to help the user monitor and tweak certain settings for better control over the device performance. The key application here is the ROG Gaming Center, which allows you to monitor the CPU and GPU clock speeds and manage quick settings like disabling the Windows key and/or the ROG key. You can set up a number of profiles and switch on the fly as you like. You can also manage other utilties like the ROG Audio Wizard and Splendid from the Gaming Center itself, allowing you to make small quick tweaks to audio and display settings respectively. Compared to other gaming laptops, this one is a little light on the preloaded softwares which is definitely a plus. 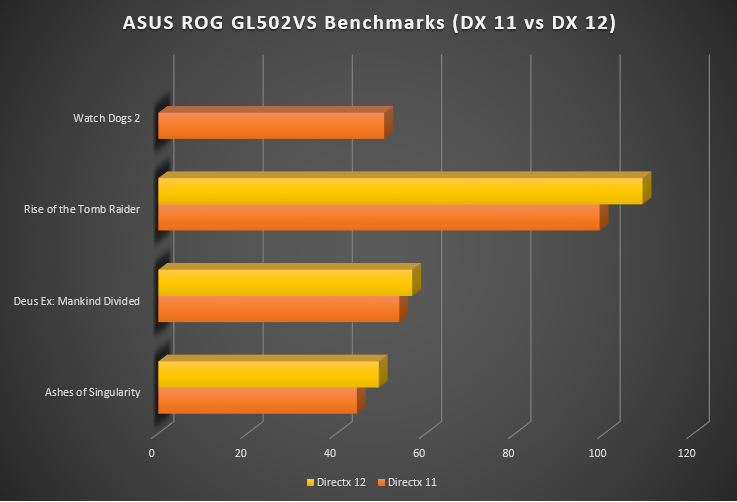 Asus has definitely done a great job with the GL502VS as far as the tech and performance is concerned. The gaming experience is almost hassle-free and the updated drivers ensure that the GTX 1070 offers best-in-class performance for the latest APIs. However, the look and feel of the laptop can’t be called premium by any means. The sheer amount of orange is not exactly pleasant to look at, though I doubt that will hamper your work or games. And the plastic comes with a boon too, keeping the laptop light and portable. 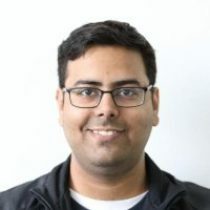 It costs well above INR 1.5 lakhs (1.66 to 1.8 depending on where you are), so you might want to consider that as well. Heating is not an issue, though you might not want not want to keep gaming for long hours continuously. The max. temperature I observed was around 86 – 87 C, after playing Watch Dogs 2 for about 5 hours at a stretch.